I’m not so hot on keeping my promises to myself. There are many I could tell about but there’s one that is right at the front of my mind because of a recent visit to a remarkable village in the eastern part of Germany. My first visit to Lohmen was in 1992 when members of my church were invited to partner with members of this former communist community to do a project to create a space for youth to meet. Here’s what I saw then and what I said to myself: EVERY time the German villagers met each other – for a day trip to Prague – for the day’s work assignments – for a fellowship meal in the church yard – these people greet each other with a handshake. Every one greets every one. It caught my eye; I liked it. I thought ‘that is an authentic way to honor other people’s personhood. I know how it feels to be left out. I know how it feels to be included. What I simple and profound way to act out my belief that each person is wonderfully created by God.’ My 1992 promise to myself was, I’m going to take the time and effort to greet others in occasions that are like the ones I witnessed in Lohmen. June 1-5 was Kirchentag in Germany. It’s a national church festival for the Evangelicals (Lutherans) and this year it was in Dresden. Since Lohmen is only 30 minutes by train from Dresden, our church was invited by our German friends to attend. Laurel and I went and I have tons of stories about the festival but right now I need to revisit my broken promise to myself. I did the handshake thing for a while but I stopped and it slipped into the shadows. The Germans are still at it – hearty handshakes all round! I was SO called to do that. I did for a while, and now I am re-called. I hope sometime we come across each other for some reason. 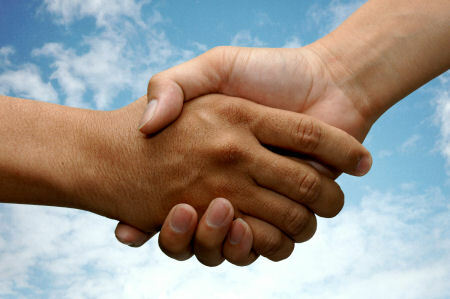 See if I keep my promise and honor the Christ in you by genuinely shaking your hand. I believe it is important to know and understand what a handshake means in the culture in which you will be shaking hands. It behooves all of us to first seek out that knowledge before we go around shaking hands, hugging, or kissing cheek.